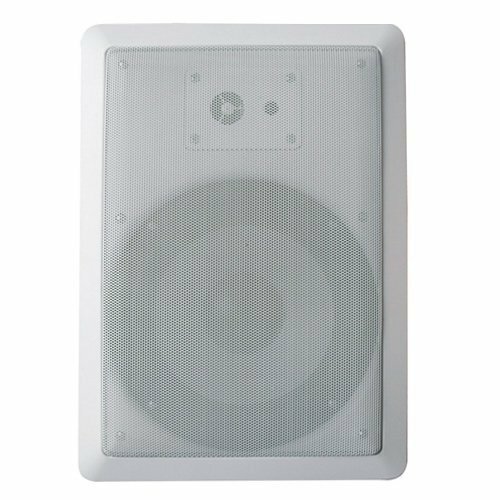 Acoustic Audio CS-IW830 8" rectangle in-wall/in-ceiling surround sound speaker is ideal for any home, office or entertainment area because it is designed with supreme performance in mind. The speaker handles 350 watts of power and includes: a 8" Poly cone woofer for improved motion and higher bass response, a butyl rubber surround, a progressive spider for greater control and higher excursion capabilities, Poly-Mica midrange, a 13mm Piezo tweeter for detailed high frequencies and a 3-Way passive crossover for greater fidelity. Spring loaded push terminals allow for easy connectivity and their low profile baffle housing was designed for simple installation and an improved frequency response. The white grill will coordinate well with any interior, or can be painted to match individual decor. Included is a cutout template to aid in the installation process. Cut Out Size: 8.66" x 12.76" Overall Size: 10.04" x 14.17"